The long awaited crack in Greece’s endless negotiation façade has finally materialised. On Friday evening last week Greek Prime Minister Alexis Tsipras called a referendum on his creditors’ proposals for next Sunday and the ECB froze the emergency cash provided to the Greek banks. Greece is imposing capital controls, limiting bank access and looks set to default on €1.54bn due to the IMF today. There is a lot of game play going on, and it is hard to be certain how it will pan out. Our understanding is that the most likely outcomes are containable. Would Merkel have told Tsipras to ‘shut up’ at dinner last week if she was scared of annoying him? Last night the US was down 2%, mirroring Monday’s Europe. This morning European markets opened down a couple of % points again. 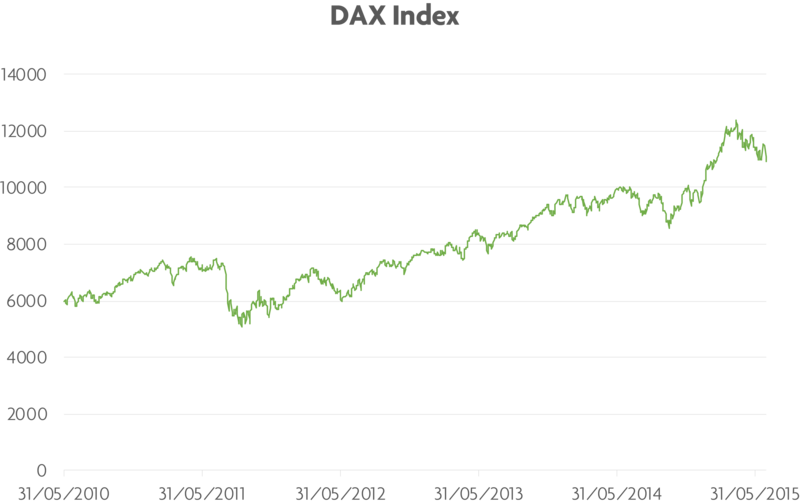 The German market over the last 5 years is shown below and remains in a primary uptrend. The European banking system is not as heavily exposed as it might have been, but time will tell whether it really has been sanitised. Of this it owes €250bn to international bailout funds (backed as follows: €56bn Germany, €42bn France, €37bn Italy, €34bn other Eurozone, €32bn IMF, €49bn other), €15bn to Greek banks, €2bn other banks, €49bn bonds, €11bn short term notes. The private sector exposure can be absorbed within banking system reserves where according to economics consultancy MRB, sovereign Greek exposure amounts to less than 1 % of reserves. There are other risks from a default and resulting Grexit. One is currency. 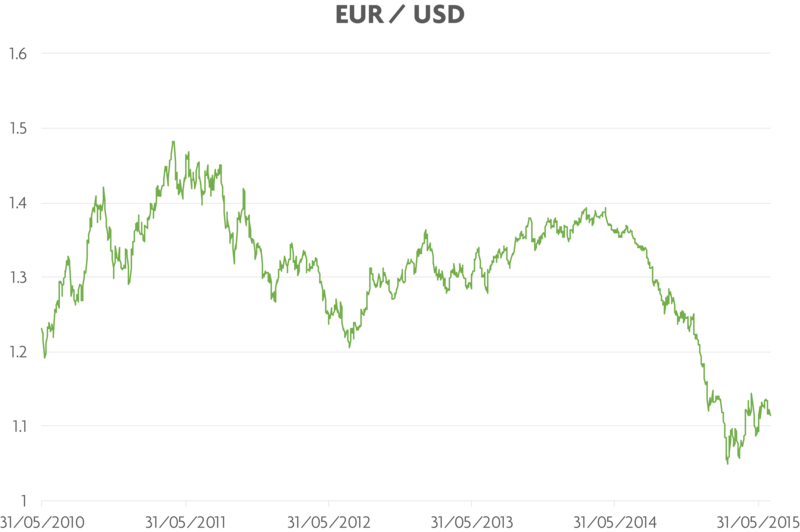 The Euro (shown below against the US Dollar) has not fallen below support and this is an encouraging sign. However, it remains weak which will continue to benefit EU exporters. Another is consumer confidence, which may be dented by dramatic Greek headlines and have a real economy effect. The main issue is the potential knock-on effect of a messy exit on markets and the banking system, almost impossible to quantify. Overall the net effect is likely to be containable, especially if Greece goes into soft arrears and works things out. In a hard default the impact could be more immediately dramatic but assuming the ECB steps up intervention efforts, may even be positive in the medium term. The 2008 crash was triggered by US Treasury Secretary Hank Paulson closing down Lehman, a bad error. Since the rest of the banks were overleveraged too, the whole system collapsed and had to be saved by state intervention. Circumstances today are different (though admittedly still far from ideal) as the banks have had to beef up their reserves and the main central banks have a pretty good grip on their bailout firepower and how to use it. If it is now necessary to let a large debtor go bust, the system is greatly strengthened. In any case there are many ways Greece can default, and although some are bad others are quite soft and there is still a chance that, despite the dramatics, Greece and its creditors can continue working together to keep it in the Euro. A Greek default has been weighing on markets for a long time, in part because a worst case scenario has had to be included in the range of outcomes. Now that we appear to be heading to a final (or semi-final) stage, we will begin to have more certainty and a clearer route to end-point. The impact in our view is likely to be contained. Last night Asian markets were up and at time of writing US futures are positive. We are not changing our investment stance for now, since there are plenty of other good things happening in markets, but we are obviously actively watching developments and backing off risk slightly.